This chicken and spinach lasagna is a popular variation on the classic lasagna that's sure to please. It's easy to sneak another vegetable (or two) in, and you're not likely to hear any complaints. Some diced cooked carrots or red bell pepper will add color and flavor. You could even replace the chicken with extra vegetables for a vegetarian lasagna. It's great with Swiss chard as well. Heat the oven to 350 F (180 C/Gas 4). Put 1/2 cup of mozzarella cheese in a bowl to reserve for the topping; set aside. In a medium bowl, combine the condensed soup and milk; set aside. Thaw the frozen spinach in a colander under running water. Press and squeeze it to remove as much water as possible. In a second medium bowl, combine spinach, egg, 1/3 cup of Parmesan cheese, and ricotta cheese; mix well. In the bottom of a 9-by-13-by-2-inch baking pan, spread 1/2 cup of the soup mixture. Arrange 4 lasagna noodles on mixture. Spoon about half of the ricotta cheese mixture over noodles, half of the chicken, 3/4 cup of Mozzarella cheese, and 1/3 of remaining soup mixture. Top with remaining noodles, remaining soup mixture, reserved 1/2 cup Mozzarella cheese, and a generous sprinkling of Parmesan cheese. Bake in the preheated oven for 40 to 50 minutes or until hot and bubbly. Let the lasagna stand 15 minutes before serving. Chicken and Swiss Chard Lasagna Cut the thick stems out of 1 pound of Swiss chard. Chop the stems. Roll the leaves into a tight roll and slice thinly; set aside. Place a deep skillet or medium saucepan over medium heat. Add 1 tablespoon of olive oil to the pan. When the olive oil is hot, add the stems to the saucepan and cook, stirring, until tender. Add 1 clove of minced garlic and continue cooking for 1 minute. Add the leaves and about 1/4 cup of water and cook until wilted. Remove with a slotted spoon and drain thoroughly. Replace the spinach in the recipe with the cooked and drained Swiss Chard. Turkey and Spinach Lasagna Replace the chicken with diced cooked turkey. 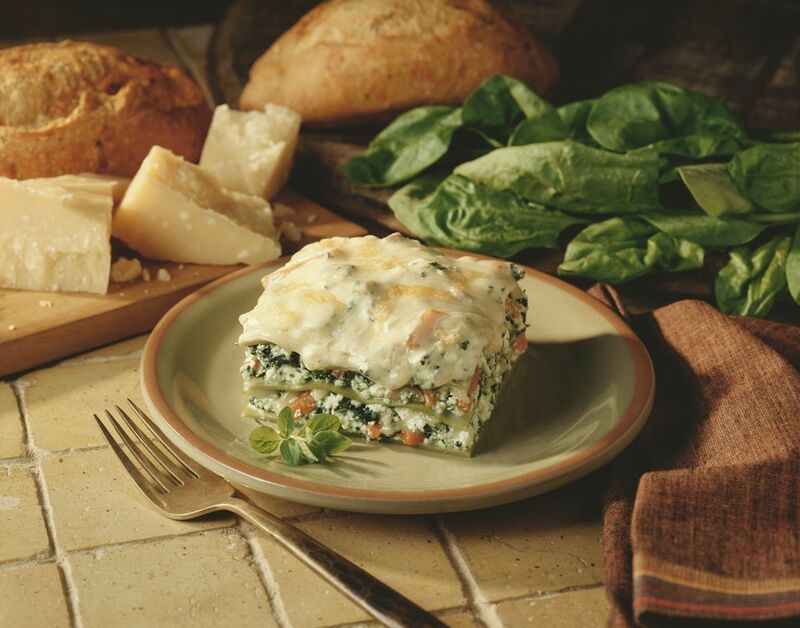 Chicken, Spinach, and Ham Lasagna Replace half of the chicken with diced cooked ham. Add some diced cooked carrots, sweet potatoes, or red bell pepper for extra flavor and color. Add some sliced sauteed mushrooms to the mushroom sauce. Replace the condensed cream of mushroom soup with cream of chicken or cream of celery. Replace the condensed soup and milk mixture with about 4 cups of prepared Alfredo sauce.